Also known as dental or composite veneers, porcelain veneers are thin, tooth-colored sheets of durable porcelain. We custom design them to improve the color, shape, size, or general appearance of your teeth. Teeth that are severely discolored, worn down, chipped, broken, irregularly shaped, or gapped can benefit from veneers. With porcelain veneers, you can quickly achieve a dramatic smile makeover – in fact, you can change your smile in virtually any way you can imagine! The procedure for getting veneers typically requires an initial consultation and three subsequent appointments to one of our dental offices in San Antonio – one to prepare your teeth for the veneers, another to bond the thin ceramic to your natural teeth, and a final follow-up visit to ensure you’ve achieved your desired results. First, give us a call! We’ll set up an appointment for you to come in and discuss your specific goals for your smile. This will help us determine whether veneers are right for you. During this visit, we will also take X-rays of your mouth and make impressions of your teeth. 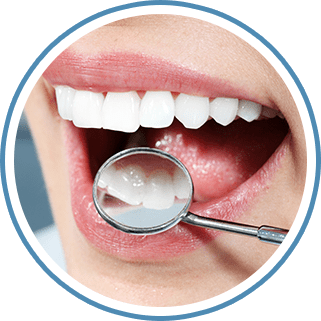 During your second appointment, we will trim roughly half a millimeter of enamel off the top of your teeth to make room for the porcelain veneers. We will also make another impression of your teeth and send the casting to the dental laboratory that will construct your veneers. Texas Dental should receive your custom-made veneers from the laboratory within 1-2 weeks. Depending on the health of your natural teeth, you may choose to have temporary veneers installed while waiting for your permanent ones. As you can imagine, since we remove enamel from your teeth during the process, veneers are a permanent procedure. Be sure you’re ready for a permanent change to your smile before you begin the process! Before cementing the porcelain veneers to your teeth, we may adjust the ceramic shells to ensure that they are the proper fit and color. We do this by trimming the veneer and altering the shade of cement used to bond the veneers to your natural teeth. Once we’re ready to begin bonding, we clean, polish, and scrape the teeth receiving the veneers – a process that helps ensure stronger bonding. We then apply a special cement to the back of your veneers, position the veneers to the front of your teeth, and shine a light beam on the veneers to seal them in place. Once properly fastened, we remove any excess cement, floss and polish your teeth, evaluate your bite, and make final adjustments. You’ll leave our office with a beautiful new smile! We recommend that you schedule a follow-up appointment for 1-2 weeks after the placement of your veneers. At this time, we will re-examine your veneers and evaluate how your gums are responding to the new porcelain additions. Lumineers are a faster and more affordable alternative to porcelain veneers. They require less prep work, so you can get a new smile in less time.